The collected works of Robert W Paul, a leading pioneer of British film. Robert W Paul is justly celebrated as the leading pioneer of British film and one of the founders of world cinema. Concentrating first on actuality films, he soon branched out, pioneering almost every kind of film from documentary to fiction and fantasy. 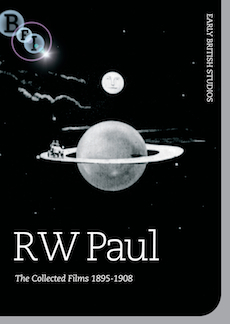 This unique DVD collection of 62 films, many preserved by the BFI National Archive, represents an attempt to bring together for the first time the collected output of RW Paul and his studio. Paul produced what is arguably the first British narrative film, A Soldier's Courtship (1896, now lost), and in 1898 became the first man to edit two scenes together in Come Along, Do!. With the help of former magician Walter Booth, he created elaborate fantasies in the mould of George Méliès such as The '?' Motorist (1906), in which an animated motorcar drives off into space and round the rings of Saturn. In addition to popular comedies, dramas, and elaborate trick films, this collection contains one of only two surviving films of the disaster caused by the launch of HMS Albion; some of the first films shot in Spain, Portugal, Egypt and Sweden, including frontline reporting from the Anglo-Boer War; Paul's famous record of the 1896 Derby and extensive coverage of Queen Victoria's Diamond Jubilee procession. These, and the numerous actuality films that Paul made, show day-to-day life in Victorian London. These rare films are presented with musical accompaniment by celebrated pianist Stephen Horne. Commentary by film historian and author Professor Ian Christie (Birkbeck College, London). Illustrated 24-page booklet with an essay by Ian Christie and an introduction to each of the films.